Let's be real: Being a social justice activist is draining, to say the least. We are constantly giving emotional and intellectual labor while being attacked and silenced by privileged people. We spend a great deal of time educating those who are willing to receive it. We also have to make the conscious effort to educate ourselves and perpetually stay up-to-date on current news, politics, social activism, and more. And we do it all for free. This is where allies and accomplices come in. You all help us by relieving some of our stress and burden. When there is white-nonsense, cis-nonsense, male-nonsense, etc., it is great to have allies willing to jump in and collect them. We truly and sincerely appreciate all of the wonderful allies who help us out! "You're so angry! I was just trying to understand but I wont bother if you're going to curse!" "You'll catch more flies with honey instead of vinegar." 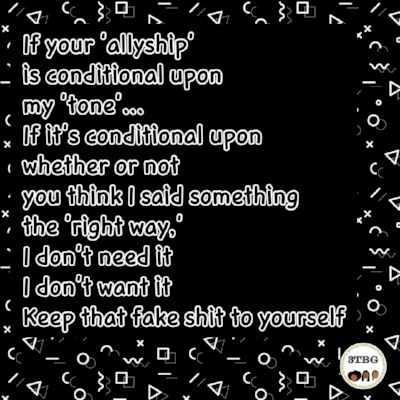 "I agree with your point, but you could have said it in a nicer way..."
When I talk about "conditional allies," I'm talking about those people who only listen to our lived experiences and stories if we are "nice" to them. These people are only willing to lend a hand if we grovel and beg. They aren't our friends and are only helping us to make themselves feel better. At the first sign of anger or frustration, they pack up and disappear. They immediately turn to racial microaggressions when we don't put up with their white savior complex. PoC and other marginalized communities have been pushed down, ignored, and silenced for too long. If you're a member of the privileged group, then it is YOUR responsibility to dismantle the system of oppression from the inside! Being an ally is great, but what we truly need are accomplices...co-conspirators. We need people who are willing to step up and use their privilege as a shield for us and as a weapon against their peers within their community. Don't tell PoC to not be angry. We are entitled to our anger. We have valid and constant reasons to be angry. What are YOU doing to erase those reasons? Why does HOW I say something matter more than my words themselves? Why are you only an ally when your feelings are coddled? Ask yourself these questions. Sit and reflect on the answers and why you feel the way you feel. Unpack this privilege and learn how to be a true accomplice and make tangible changes.